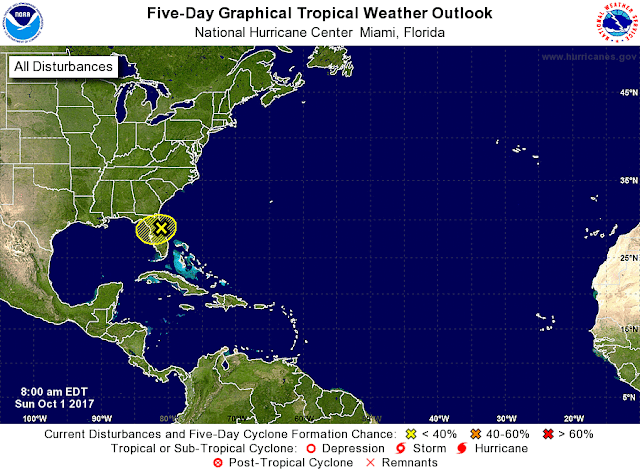 NOAA's National Hurricane Center issued a Tropical Weather Outlook due an area of low pressure impacting Florida. The system, dubbed Invest 99L, extends from the eastern Gulf of Mexico across portions of Florida and is presently producing an area of disorganized showers and thunderstorms and gusty winds near the east coast of central and northern Florida. NHC forecasters say that, due to unfavorable upper-level winds, Invest 99L is expected to weaken into a trough and move westward across the northern Florida Peninsula and into the northeastern Gulf of Mexico during the next couple of days. Regardless of development, this system will produce gusty winds and locally heavy rains over portions of northeastern Florida and southeastern Georgia through tonight. Invest 99L has a 0% chance of tropical cyclone formation within the next 48 hours. Spaghetti models are in general agreement that Invest 99L will move over the northern Florida peninsula and then turn westward over the Gulf of Mexico.